Gallo had joined the News even before entering the Marine Corps, and he has remained with the paper to this day. 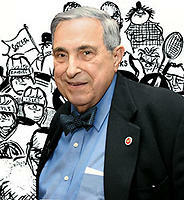 After doing various cartooning and art jobs at the News, Gallo became its standby sports cartoonist and later its regular sports illustrator, after Willard Mullin’s partial retirement in the late 1960s. In addition Gallo also draws an occasional editorial cartoon, and in the early 1970s he created Basement Bertha, a Sunday half-page with a sports theme (Basement Bertha was originally Casey Stengel’s most loyal and vociferous fan in Gallo’s cartoons about the New York Mets). Bill Gallo has received many cartooning and sports awards, including several Page One awards and National Cartoonists Society Best Sports Cartoonist awards. He was president of the NCS from 1973 to 1977.